This cedar home in located on Mount Spokane area, lots of UV and snow bombard this house with no shade or cover to help protect it! They hired us to restore their cedar home back to new condition! Our specialty! As you can see, this sun baked cedar siding looks beyond help! Be sure to call us if you feel that way about your cedar home, we know we can restore and repair your home back to new condition, we haven’t met a piece of wood we can’t conquer! 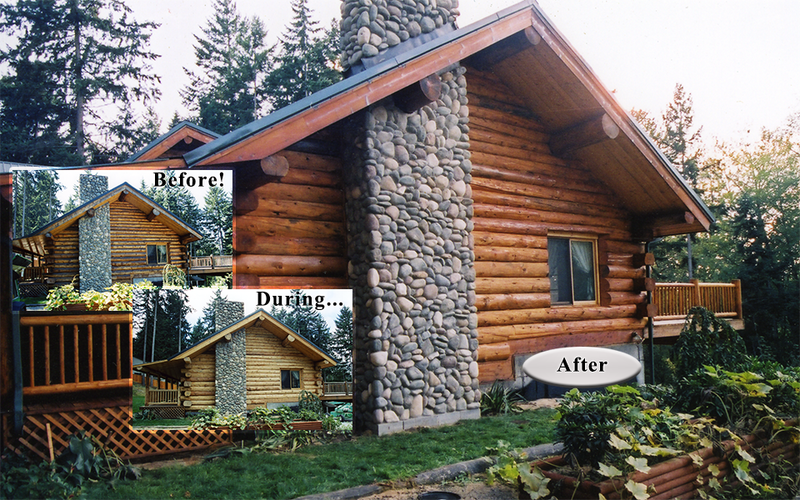 In this photo, we have applied the Lovitt’s Cleaner/Brightener to one wall and have power washed off the failed and darkened stain on the logs. One Lovitt’s Cleaner/Brightener Kit can restore up to 1000 square feet of wood surface! This cedar home will soon look even better than when it did when it was first built and finished 20 years ago!